I will never forget walking into the “gym” for the first time. I was the girl who wore long sleeves and pants with a jacket around my waist to hide the “jiggle” as I worked out. I sweated A LOT! I knew if I wanted to hit my physical goal I needed to get into action. I found a few trainers that taught me how to use “the machines” that looked like robots to me. I didn’t dare walk into “man land” on my own. I used to watch the cute fit girls walk around the gym doing their lunges, squats, and pull ups secretly wondering if they knew what it felt like doing that carrying an extra 80 lbs. on their bodies. Lets just be real I WAS JEALOUS. I wanted to wear a tank top and strut around with defined arms, the rate I was going it would happen when I turned 87. I started working out at a smaller gym, “The Steel Room” and I loved the community and accountability that they provided. I told my new trainer Christy my goals of strutting around with a tank top with defined arms doubting that it could ever be me. I secretly told her I wanted to do ONE pull up one day. I hated sharing my goals with anyone that way when I didn’t accomplish or quit on them no one would know and be disappointed. Each week I worked hard and kept up with what week I was on, they set me up for success with a great plan. But by week 14 I wanted to QUIT, I wasn’t seeing the scale move or visible results so what was the point! Christy reminded that I needed to keep “training” and believe her in the “waiting.” My heart truly wanted to believe her but then my head wanted to remind her that my body had been up to 280 lbs. and I had to FIGHT to actually see small changes. The waiting period was TORTURE. It made me reflect back when my husband lost his corporate flying job and being a stay at home mom we had to make some hard decisions. There was a 3 year “waiting” period before God revealed our next calling. I remember lying in bed crying asking God why we were not moving forward, and the unsettled feeling in my heart made me crumble. It hit me like lightening when I walked up to the pull up bar to “try” to do my first pull up (without assistance) that the 3 year “waiting” period that I viewed as torture was actually a “training period.” God was shaping, teaching, and molding us for our next assignment. Isaiah 30:18 …but they who wait for the LORD shall renew their strength; they shall mount up with wings like eagles; they shall run and not be weary; they shall walk and not faint. 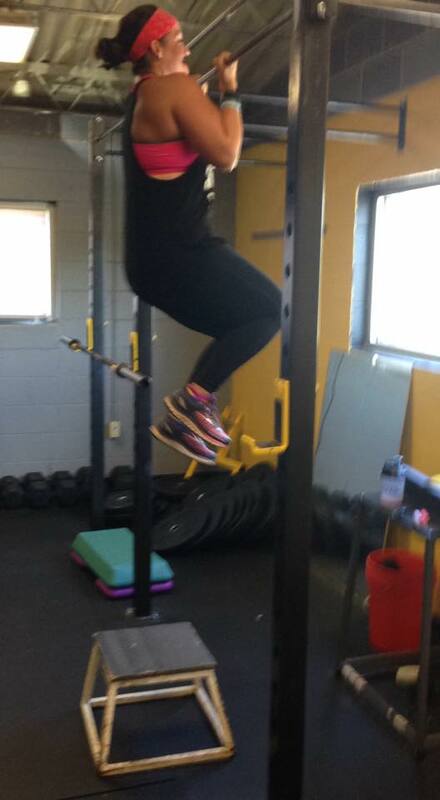 I DID IT, I did 3 pull ups by myself and the feeling of accomplishment washed over my heart! I doubted myself THE WHOLE WAY but I had Christy in my ear and in my corner pushing and challenging me. I realized the fruit of my labor the last 30 weeks was WORTH it because I was accomplishing things I only dreamed of. I will always view each “waiting” period God puts me in as a chance to be “TRAINED” up and to never grow weary. 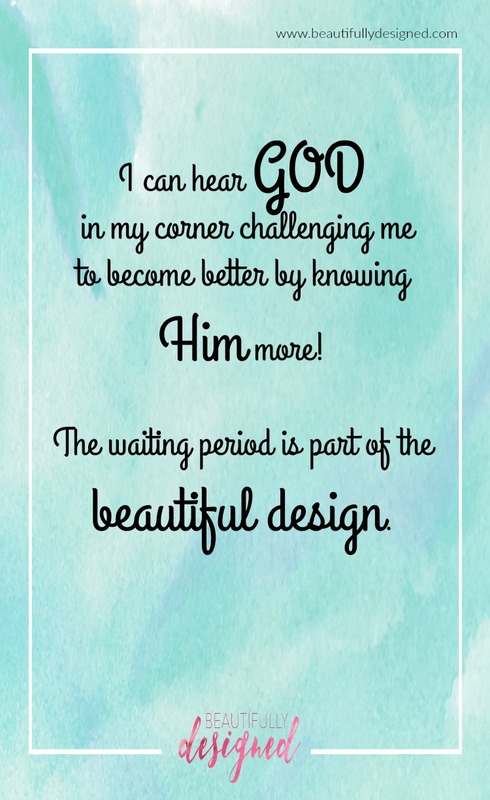 I can hear GOD in my corner challenging me to become better by knowing HIM more! The waiting period is part of the beautiful design. « I Looked Happy; But I was Trapped! May God continue to bless you and your family for your willingness to serve and follow Christ’s calling and instruction!